Intro: WoofbertVR offers the most innovative and transformative VR experience available in art and culture. Travel to a museum, explore an artist’s studio, or zoom in close enough to step inside a painting and travel back in time. Totally immersive, visually stunning, WoofbertVR is the ultimate VR art experience. WoofbertVR reshapes the landscape of storytelling and revolutionizes the way the world looks at art. Global culture. Virtually accessible. 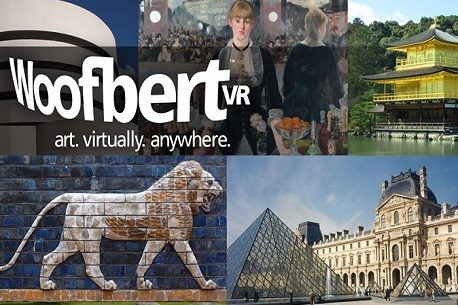 Review: Woofbert VR features some of the world’s leading museums and allows you to tour their best exhibits. But not only that but it also takes you into a few of them as well. This isn’t so much an experience, it is more an interactive educational tour features some truly amazing art. They basically take high resolutions scans of each picture and then showcase them in a 3D environment. This is a VR education app done the right way. Verdict: For people who love the arts and people studying them, Woofbert VR is a great example of the diversity the VR platform offers. Some of the art galleries you will see here are places that you might never visit in real life. An art class can’t all tour the world studying the masters of art, but with this app they can! It also works the other way around and helps get the beautiful these amazing galleries hold into the eyes of the public and that is sure to encourage more and more people to visit them in real life. No matter what your opinion on the art is, you should still download it and have a look yourself as this app might well make you appreciate art a little more.